I was recently talking to Damien Lardoux of EQ investors, a man who lives and breathes Socially responsible investing, and I asked him what he was reading at the moment. He told me he had just started ‘Doughnut Economics’ by Kate Raworth so I went straight out and bought it. I am so glad I did! This is a book which pulls no punches and lays it on the line that Economics is broken! Current economic theory neither predicts or helps avert financial crisis and we still have a global population which incorporates both mega wealth and extreme poverty. Raworth sets about debunking the myth that growth equates to happiness and satisfaction. She rightly highlights the obsession we have with GDP as a measurement (I suppose it makes a change from the more topical GDPR!!) but as she points out, this really is a blunt instrument as a measurement. I had never fully appreciated how obsessed we are with GDP. The headlines are full of GDP forecasts and actual results are either delivered in an upbeat or gloomy tome giving added weight to their significance. Incorporated into this economic book is the assertion that we cannot ignore our consumptive nature which is bleeding this planets natural resources ( our obsession with growth again) and the far reaching consequences this could ultimately have. Can we live in a more fairer society with better stewardship of the resources we have? Raworth thinks so. 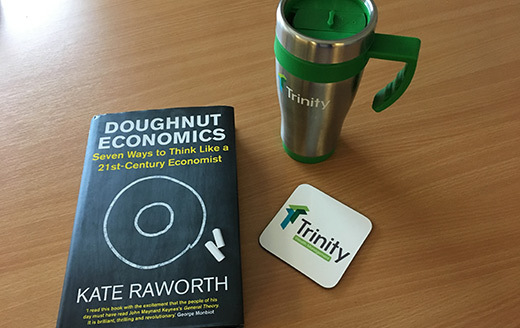 The actual title of the book is ‘Doughnut Economics – Seven ways to think like a 21st Century Economist’ and this is where her Doughnut Model comes in. The diagram consists of two rings. The inner ring of the doughnut represents a sufficiency of the resources we need to lead a good life: food, clean water, housing, sanitation, energy, education, healthcare, democracy. Anyone living within that ring, in the hole in the middle of the doughnut, is in a state of deprivation. The outer ring of the doughnut consists of the Earth’s environmental limits, beyond which we inflict dangerous levels of climate change, ozone depletion, water pollution, loss of species and other assaults on the living world. Corporate Social Responsibility is certainly a buzzword, and Raworth highlights that there are many businesses who have jumped onto this bandwagon because they see it as a beneficial marketing tool. She calls this a the ‘Do what pays’ stage which is one up from the ‘Do nothing’ stage. Raworth challenges us to respond by making our business a ‘generous business’ which in essence is to create a business that ‘embraces biosphere stewardship and recognises that we have a responsibility to leave the living world in a better state than we found it’ A worthy challenge indeed and one which we are keen to embrace here at Trinity Wealth Management. Having read the book I was delighted to acquire two tickets to go hear Raworth lecture at Ruskin University in Cambridge. With 45 minutes before the start of the talk I was on the outskirts of the city center when I hit traffic. I finally parked my car half an hour after the lecture had begun. Oh the irony!